There are individuals who believe that e-Government is one of the most important applications of ICT since the development of the Internet and the web in the last decade of the 20th century. This view is based on the fact that everyone in a modern society has to regularly interact with some part of the government. Interaction with the government has traditionally been a time consuming chore which often led to frustration. e-Government has the potential to make citizens relationships with government much more satisfactory by reducing and simplifying the way in which they can communicate and transact with government. 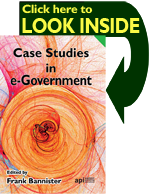 Case Studies in e-Government Research reports on some of the latest thinking in the field of e-Government. 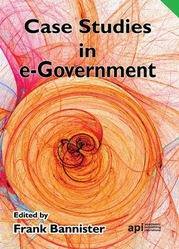 This book is of value to a wide range of individuals working with e-Government including, academics, their students and researchers as well as civil servants, other public sector employees, consultants and practicing e-Government professionals. 234 pages.